The poor sick dolphin jiyu at dolphin base “swim with” in taiji is gone and feared dead as there was a dolphin killer here when we arrived. 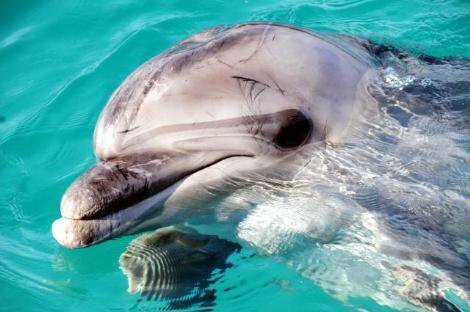 These trainers told the police they “love” dolphins–but this is how they solve a “problem dolphin”. –by selling him to the killers for meat? 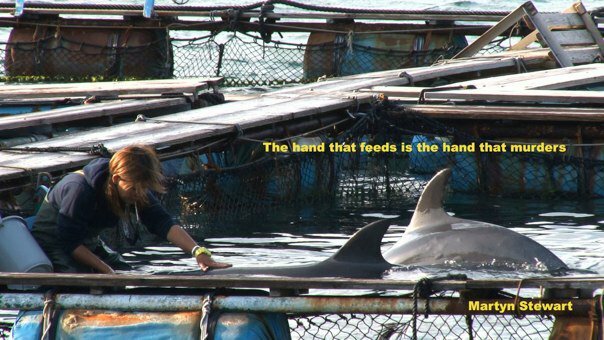 Taiji, Japan is the modern-day Auschwitz for Dolphins. Each year over 2000 dolphins are driven into a cove by disabling their sonar with deafening sound. Once netted off in the cove trainers come from the Whale Museum. Dressed in wetsuits they enter the water to select dolphins for captivity. This selection process is brutal. Juveniles are ripped from their mothers sides. Many dolphins have drowned as the trainers tackle them in the water. Once selected they are kept netted off from their pod. The dolphin hunters then drag the rest of the pod under the blue tarps of shame where they die unspeakable deaths at the hands of the killers, their suffering lasting almost 10 minutes. The Japanese government claimed the dolphins die within seconds but thanks to Dieter Hagmann’s revealing secret footage that follows the hunters under the blue tarps of death and shame the world can see why the killers go to such great lengths to hide their dirty work. The film revealed to the world dolphin suffering so cruel beyond imagination. See the trainers website http://wave.ap.teacup.com/rajya/. It is called “Our Life”. I would ask them what about the lives of the dolphins? When do they start counting? 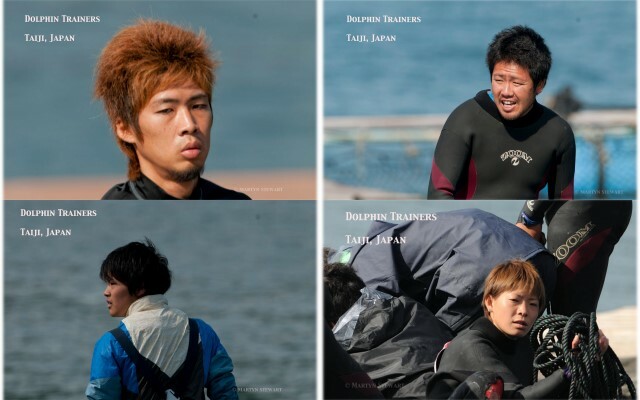 The dolphin trainers at dolphin base are not your usual young people in their twenties and thirties, full of life, hoping to make the world a better place. Somehow their world has become dark and distorted. Current scientific findings revealing brains the size of mans, and superior intelligence in dolphins means nothing to the trainers. In Taiji dolphins are seen as no more than a commodity, dead or alive. These young people may have become dolphin trainers for the glitz and sparkle but the world can see they are far from it in Taiji. These supposed “trainers” are in fact no more than soldiers in a death camp, who are abusing the inmates, and then showing up for the executions. 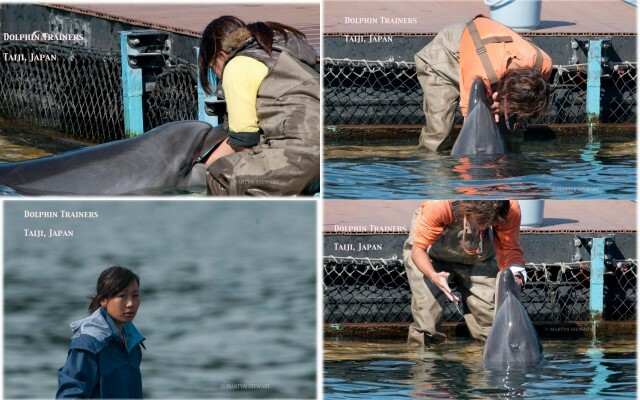 In no way does their behavior suggest that they care for the dolphins. Instead they exhibit a perverse desire to dominate, and oppress, these gentle beings. Much like the dolphin hunters the dolphin trainers show no sympathy toward their charges. Their days are spent visiting the outdoor sea pens where their job is to break the will of dolphins that have already experienced such tragedy. These dolphins have watched their parents and family murdered. They have swam in the blood of their families sometimes for days. Trapped in tiny pens with three to four other dolphins the trainers use food deprivation as a way to break their spirits. 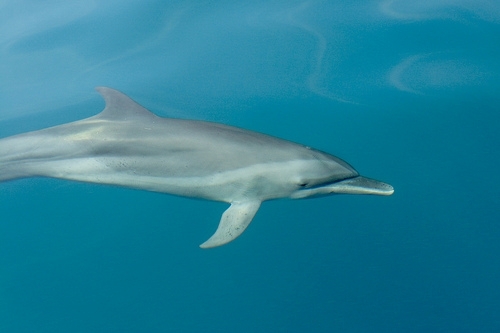 Some dolphins become so hungry, and stressed they have eaten plastic and garbage. Photos provided by Martyn Stewart Trainers reached directly into the dolphins delicate stomach with bare hands. The brave photographer who took these shots Martyn Stewart, had a special message for the dolphin trainers that have taken such a dark path in life. Photo Provided by Martyn Stewart Shouldn't They Be Free? We can only hope that the dolphin trainers of Taiji will see the light and turn away from the cruel and dark path they have chosen, exploiting dolphins. If only they could see how much more valuable our friends of the sea are swimming free with their families. They are so willing to work with man and share their gifts! Japanese dolphin drive industries are supported by the dolphinariums, swim with dolphins, and aquariums worldwide. For every 100 dolphins slaughtered one to two are taken for captivity. Each day more and more marine parks are being built. The many middle eastern countries are adding them at exponential rates building whole communities around tiny dolphinariums stocked with dolphins from drive fisheries. The life span of the Taiji dolphins in captivity lasts 5 years at the most, with many dying within the first two months of capture. Please take the pledge to boycott all marine aquariums, and dolphinariums! What can you do? 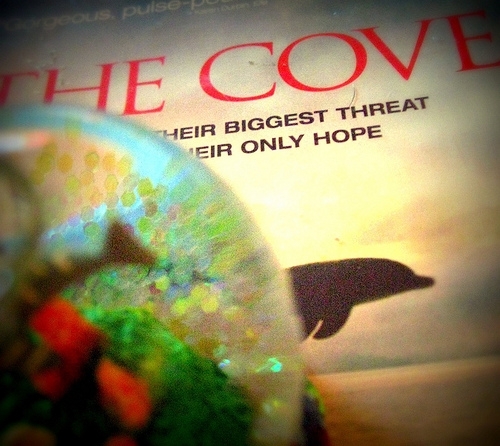 Tell your friends to watch “The Cove” for free online: http://topdocumentaryfilms.com/cove/ or have them watch “A Fall From Freedom” also online for free http://afallfromfreedom.org/. Today, dolphins are known to be highly intelligent, and self-aware beings with brains comparable to mans. Every day more scientific data is compiled on how similar dolphins and humans really are. 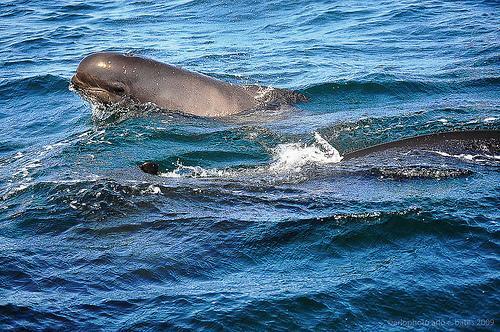 They carry their offspring for about the same amount of time and nurse their young for as long as 2 to 3 years, the pilot whale as long as 6 years. Dolphin groups known as pods live in socially complex societies consisting of families, that show advanced cultures and traditions. Dolphins have interacted with man since time began, trying to help when ever needed, to reach out and share their many gifts of love and laughter freely. September 1st marks a sad days for the dolphins swimming near the coast of Taiji, Japan. 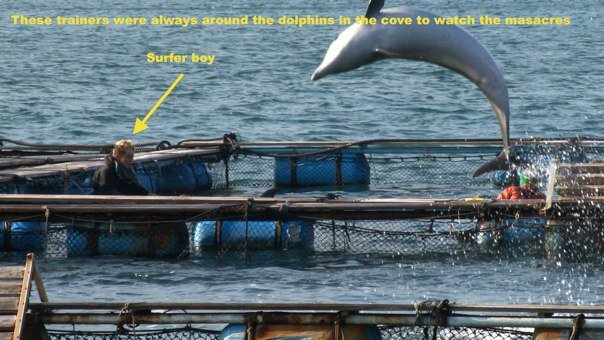 As exposed, by the academy award-winning film, “The Cove” the traditional practice of driving pods of dolphins into the blood cove continues. Each year up to 20,000 dolphins are murdered in Taiji Japan. The Taiji dolphin hunters confuse the dolphins using a wall of sound created by dropping metal pipes into the water and then tapping on them. Once the dolphins sonar is rendered useless, the hunters drive the pod into the cove using boats. The pod is separated, the attractive young netted off from their parents, family and community. These young dolphins, are forced to hear their families brutally slaughtered while they swim in their blood. The selected juveniles dolphins are trained and sold into captivity upwards of $100,000. Once sold, they are packed in ice and shipped worldwide, destined to spend their lives in small cement tanks forced to perform for their food. Their lifespan shortened by as much as 95%, most die within the first year. The dolphins are left in netted pens overnight. The hunters return the following morning to begin the slaughter. 26 sadistic men, savagely murder the remaining dolphins, the death toll rising into the hundreds and thousands. Their thrashing bodies, and cries for mercy echo through the cove as entire communities of dolphins, their traditions, their sparkle, their love, gone forever. The dolphin drives of Taiji are big business for the Fisherman’s Union of Taiji. The dolphin captivity trade for marine parks and aquariums supports the cove killings. This is income the hunters, are not willing to give up regardless of the dolphins suffering, so clear to the world. The Japanese people now know that the dolphin meat served to their children in public schools is tainted with high levels of Mercury and toxins from Fukushima Nuclear Power Plant. They too are rising against the Japanese Government, and the Fisherman’s Union of Taiji demanding they stop poisoning the children of Japan. Taiji was not affected by the tsunami although it experienced some high swells. The hunters of the Fisherman’s Union quickly jumped into their banger boats and headed out to sea leaving the dolphins locked in Harbor pens. As the water rushed on the shoreline the dolphins were rushed over the jagged rocks. Twenty six captive dolphins perished. On September 1st, 2011 the people of Charlotte, North Carolina will join the world in asking Japan to stop issuing permits to slaughter dolphins. All North Carolinians and visitors please join us as we stand up for the dolphins of Taiji. Be part of the biggest movement on the planet, saving the oceans, and saving sentient, self-aware beings, the dolphins. Detail about the rally are listed here and below. The rally will located in Marshall Park in Downtown Charlotte and will run from 12-2pm. We at Save Misty the Dolphin “believe in the power of you and I”! We are rallying together at the General Consulate of Japan. Our message is simple: JAPAN, LET THE DOLPHINS LIVE & BE FREE!!! *A few things I would like everyone to keep in mind (all pretty obvious but I have to say it) – Thank you*We will be on walk ways please let the general public past. We want them to like us so please be courteous. *By all means hand out literature but please refrain from using very gruesome or obviously SHOCKING images. Let people know the facts, leave people with the option of looking up the messy details. *Please do not use abusive language if we are heckled! *Anyone found to be damaging property, being aggresive or racist will be removed from the march. *We take no reponsiibility for your welfare or that of you possessions while at the rally. You are responsibile for your own actions and belongings. *please remember we want to avoid negative attention. *Listen to the event organizers as they are there to help us all and keep us together and safe! *Please do make placards or posters to bring along to let everyone know why you are there. Be creative! *Wear you supportive t -shirts / outfits. *Bring with you a smile and positive attitude. This is a positive step towards getting people involved and raising awareness. *Talk with the general public if they approach you. Let them know what it’s all about. *Please do take pictures, videos and most of all enjoy the experience! “Celebrate Japan Dolphin Day” of Save Japan Dolphins. By Kirsten MassebeauToday, dolphins are known to be highly intelligent, and self-aware beings with brains comparable to mans. Every day more scientific data is compiled on how similar dolphins and humans really are. 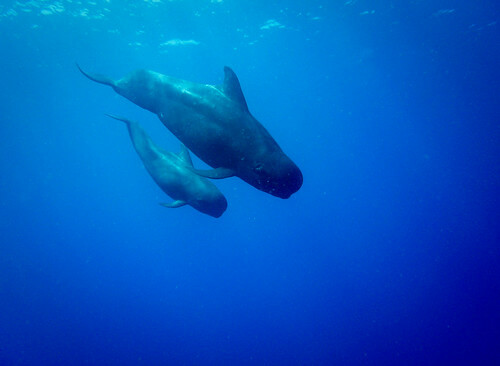 They carry their offspring for about the same amount of time and nurse their young for as long as 2 to 3 years, the pilot whale as long as 6 years. Dolphin groups known as pods live in socially complex societies consisting of families, that show advanced cultures and traditions. Dolphins have interacted with man since time began, trying to help when ever needed, to reach out and share their many gifts of love and laughter freely. September 1st marks a sad days for the dolphins swimming near the coast of Taiji, Japan. 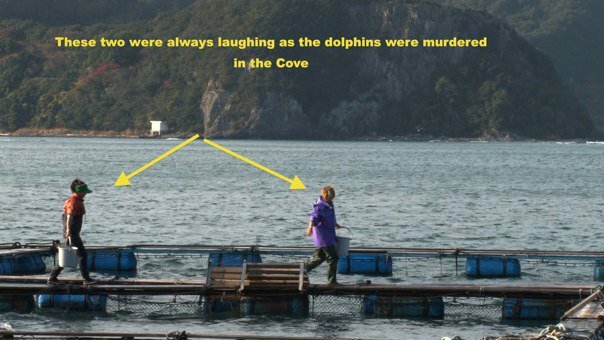 As exposed, by the academy award-winning film, “The Cove” the traditional practice of driving pods of dolphins into the blood cove continues. Each year up to 20,000 dolphins are murdered in Taiji Japan. The Taiji dolphin hunters confuse the dolphins using a wall of sound created by dropping metal pipes into the water and then tapping on them. Once the dolphins sonar is rendered useless, the hunters drive the pod into the cove using boats. The pod is separated, the attractive young netted off from their parents, family and community. These young dolphins, are forced to hear their families brutally slaughtered while they swim in their blood. 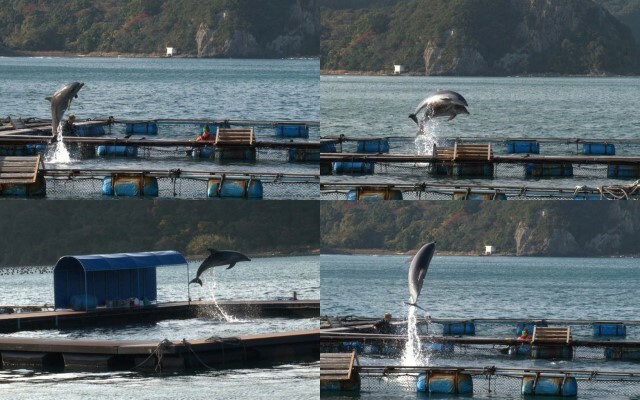 The selected juveniles dolphins are trained and sold into captivity upwards of $100,000. Once sold, they are packed in ice and shipped worldwide, destined to spend their lives in small cement tanks forced to perform for their food. Their lifespan shortened by as much as 95%, most die within the first year. The dolphins are left in netted pens overnight. The hunters return the following morning to begin the slaughter. 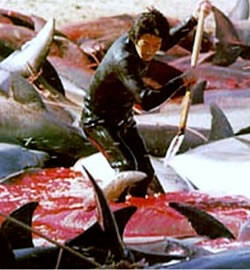 26 sadistic men, savagely murder the remaining dolphins, the death toll rising into the hundreds and thousands. Their thrashing bodies, and cries for mercy echo through the cove as entire communities of dolphins, their traditions, their sparkle, their love, gone forever. The dolphin drives of Taiji are big business for the Fisherman’s Union of Taiji. The dolphin captivity trade for marine parks and aquariums supports the cove killings. This is income the hunters, are not willing to give up regardless of the dolphins suffering, so clear to the world. The Japanese people now know that the dolphin meat served to their children in public schools is tainted with high levels of Mercury and toxins from Fukushima Nuclear Power Plant. They too are rising against the Japanese Government, and the Fisherman’s Union of Taiji demanding they stop poisoning the children of Japan. 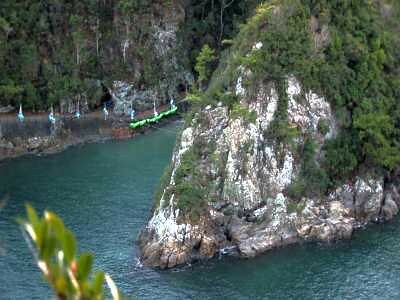 Taiji was not affected by the tsunami although it experienced some high swells. The hunters of the Fisherman’s Union quickly jumped into their banger boats and headed out to sea leaving the dolphins locked in Harbor pens. As the water rushed on the shoreline the dolphins were rushed over the jagged rocks. Twenty six captive dolphins perished. On September 1st, 2011 the people of Seattle, Washington will join the world in asking Japan to stop issuing permits to slaughter dolphins. All Washingtonians and visitors please join us as we stand up for the dolphins of Taiji. Be part of the biggest movement on the planet, saving the oceans, and saving sentient, self-aware beings, the dolphins. Details about the rally are listed below. The rally begins at 1pm and will run from 1pm to 4pm in front of the Consulate General of Japan, in Seattle. *Listen to the event organizers as they are there to help us all and keep us together and safe! On a happier note…. The first post from Scott West in Taiji, via A Teen Age Activist ignited the whale and dolphin activists world wide. For the next two days Scott West of Sea Shepherds and Brian Barnes of Save Japan Dolphins released pictures and updates as a pod of intelligent, sensitive, pilot whales were brutally murdered in the blood cove. The fisherman of Taiji thought they would be able to carry out this crime against these defenseless beings without detection. They didn’t realize when they met at 4am prior to the slaughter that morning, that their every move would be recorded and reported to the world. During the next 48 hours A Teen Age Activist posted 43 times with breaking news as the murders hung the blue tarps of death, sharpened their knives, and then eventually lead mothers and fathers under the blue tarp for a violent death like no other. 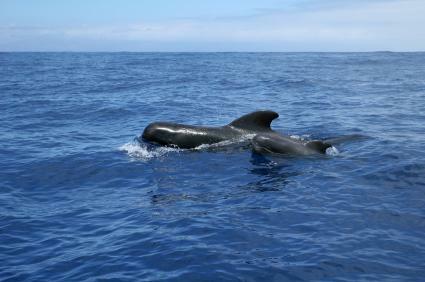 On May 4, 2011 at 13:50 a picture of the pilot whales in a netted area was released. You can see them close up. The fear in their eyes came through so clearly. 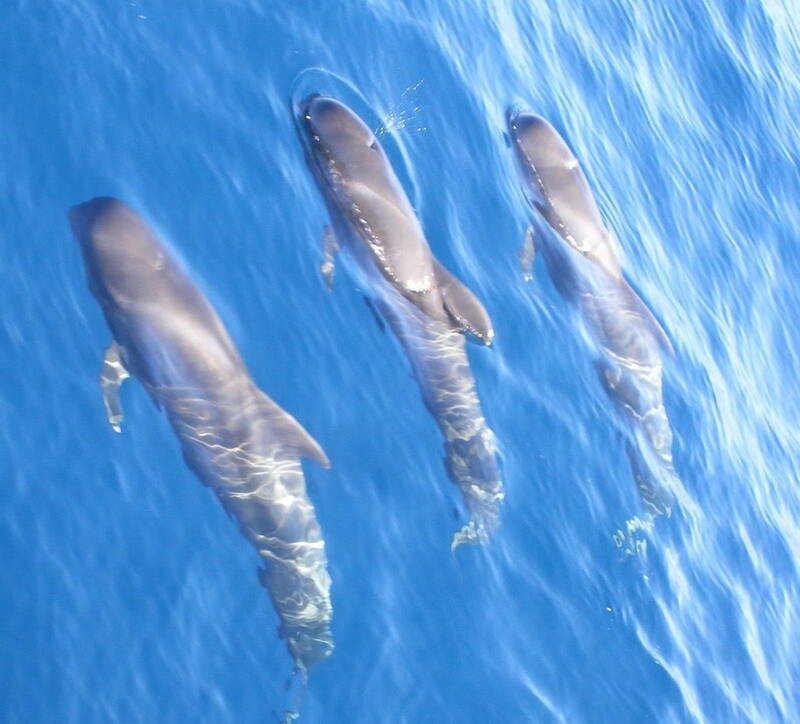 Posts on Facebook from activists reflected the love and concern for the pilot whales! To know that these gentle beings, with such expressive faces were to undergo a death beyond imagination was more than many could take. The entire community of dolphin and whale activists buzzed with anger, and an out pouring of love. On May 4, 2011 at 15:03 the first bloody images posted to Facebook by Brian Barnes. 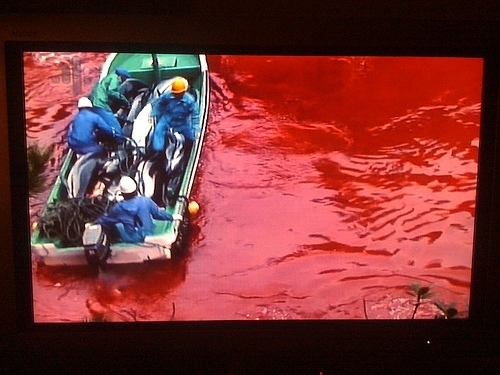 What had seemed just a nightmare became a reality as evidenced by the blood flowing freely in the cove. Thanks to Scott West, Brian Barnes, and A Teen Age Activist “their dirty little secret” had been exposed to the world again. 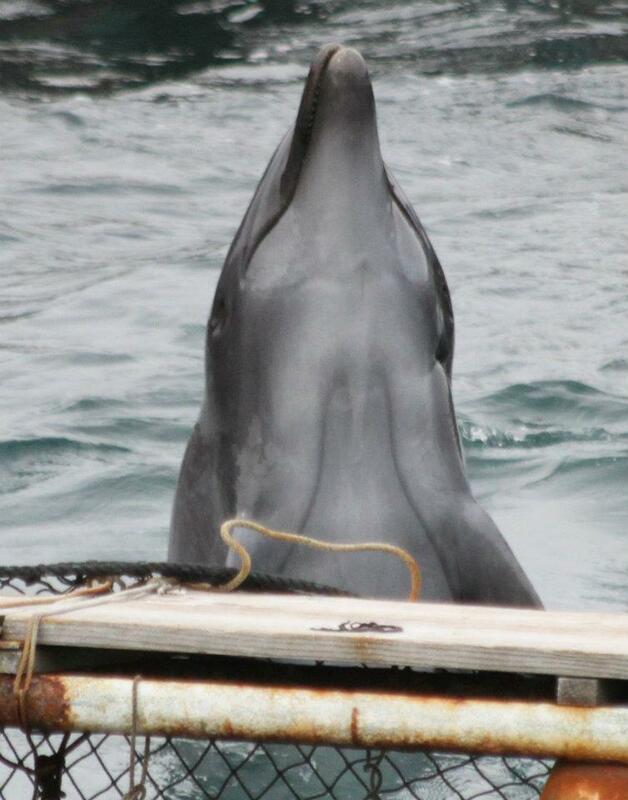 No longer could they carry out their sadistic, and cruel torture of dolphins without the eyes of the world watching. As two horrific days unfolded Facebook was alive twenty four hours a day. Everyone wanted to know what do we do? Scott West, Brian Barnes, and Steven Thompson another activist in Japan encouraged the entire community to call the Japanese Embassies and ask them to spare the pregnant mothers and babies. The Sea Shepherds released a page with all of the Japanese Embassies listed. The calling began. Not every Japanese embassy was glad to hear from an activist. The San Francisco Public Relations officer of the Embassy make a pesimistic statement, “If you think your call can save those pilot whales you are mistaken. You are wasting your time”. On May 5, 2011 at 17:39 Scott West reported via A Teen Age Activist, “But for the public outcry, I am sure all of these whales would be dead. They may still die anyway without their parents and leaders, but thank you all for making the calls. -Scott. Their were 20 babies left. When the fisherman opened the nets the babies just huddled into a corner. Never once did they stop trying to look under the tarps to catch a glimpse of their mother or father who was long since dead. Eventually the dolphin molesters opened the nets and drove the children out to sea. Their chances of survival are not good because they are babies without the skills to hunt, many of the babies not weened from mothers milk. Gratefully, they were not led one by one to under the blue tarps to their death. At last the blood cove was quiet. Activists continue the fight to end the mass slaughter of dolphins in Taiji. The love expressed on Facebook for these gentle being was remarkable. Although the Cove Guardians, and Save Japan Dolphins are no longer in Taiji the battle to save dolphins and all cetaceans continue the fight. A Teen Age Activist encourages all activists to continue making phone calls to the Japanese Embassies, and to keep sending emails and letters to the Japanese Government asking them to stop murdering dolphins and whales. Make Today A Day for all the Dolphins of Taiji, Please Call and Write Now. They need us! 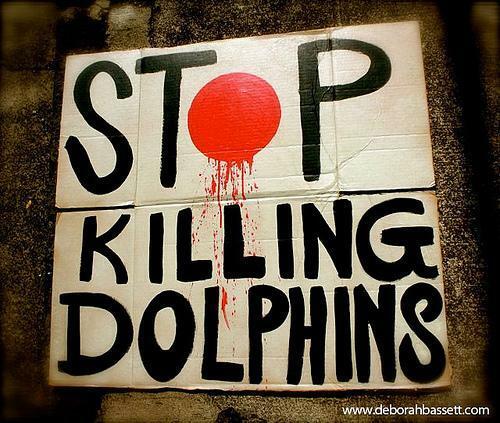 Taiji Dolphin Slaughter 2011 April 6 Action Now!! The public relations person in San Francisco said, “If you think you can save those pilot whales by calling the embassies you are only fooling yourselves”. I believe we must make the call anyway!! Let our voices be heard.